Touch Type Like a Pro! Type real words and phrases before the end of lesson one! Improve your typing speed, accuracy and confidence for work, education and home. LEARN TYPING is prepared with you in mind. Learn Typing is an online free typing tutor. Our free typing lessons have been prepared for people of all ages, experiences and skill levels to learn how to type. Includes free typing test, game, video tutorials and support. "Some time ago I decided to learn typing and used a free typing tutor programme. After 40 hours typing in one week I could touch type 25 words per minute. I learned two things: (1) if you want to learn typing you need to be prepared to work and (2) you need a good typing tutor to help you learn how to type. I wish I'd come across this typing tutor sooner." The Learn Typing free online typing tutor has beginner and advanced typing lessons as well as timed typing tests and keyboard shortcuts. These will make your typing practice soooooo much easier. ​With Learn Typing, you can enjoy free typing lessons at your skill level. secondary students, young adults and seniors (in the classroom and online) to learn how to type. This wide typing experience has brought together a typing programme that can you to learn how to type. BECOME A FAST, ACCURATE and CONFIDENT TOUCH TYPIST! 1. To receive the FULL benefits of this free online Learn Typing tutor, be sure to complete ALL sections of: Beginner Typing Lessons and Advanced Typing Skills. 2. To succeed with Learn Typing, start with a typing lesson at your level and don't move on too soon. This will build a strong foundation for your typing skills. 3. You must Practise! Practise! Practise! both Beginner and Advanced Typing sections AND the Typing Tests to learn typing and succeed with your work, education and personal goals. People often Google, “how to learn typing”. You will learn how to type if you follow these tips while doing our free typing lessons and tests. You will learn typing and not look back. Our website will teach you to touch type. 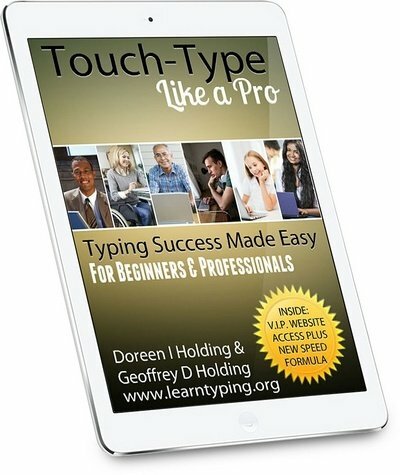 Our e-Book will teach you to TOUCH TYPE LIKE A PRO and master the keyboard. © Learn Typing 2007 All Rights Reserved.